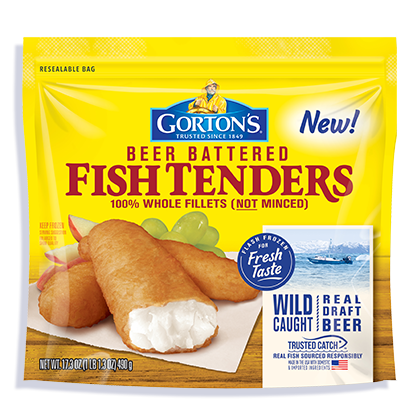 100% whole, wild-caught tenders in a crispy beer batter. For anyone who’s ever wondered, “what part of the chicken is a nugget?” Crisped to perfection, our Beer Battered Tenders are the perfect dippable companion to any meal. 3. Bake 15-17 minutes total*. Flip after 8 minutes. For extra crunch or cooking more than 6 tenders, add 3 minutes to the cooking time. INGREDIENTS: Pollock fillets, batter coating, vegetable oil. 130 mg of EPA and DHA Omega-3 fatty acids per serving.